When someone fantasizes about their dream wedding, cost doesn’t really come into the picture. Fretting over price tags and debt payments isn’t very romantic, so we tend to ignore the reality of wedding expenses until it’s time to foot the bill. This can be especially damaging for someone with poor credit. If you don’t take the time to examine the possibilities and prepare accordingly, any financing options available to you might be interest-heavy and less-than-reputable. 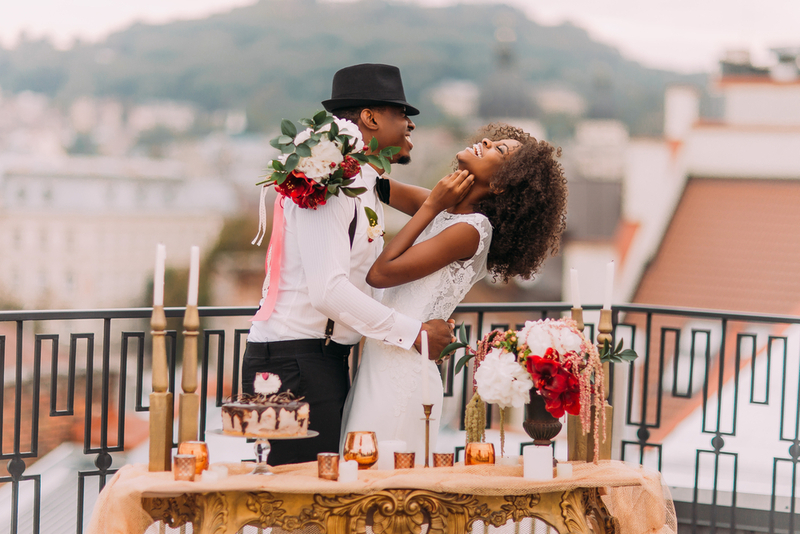 Thinking about wedding costs and how to plan a wedding without damaging your credit might not be very romantic, but trying to pay for a wedding you can’t afford is even less so. If you’re planning a wedding and worried about how your credit could affect the process, read ahead for everything you need to know. The Knot’s 2018 wedding survey found that the average wedding cost $33,931, a 1.6% increase over the previous year. That may seem like a minor increase, but it’s part of a decades-long trend that has far outpaced the rate of inflation. One reason for the increase is that expectations are higher than they used to be. Where it used to be common for couples to hold a ceremony and modest reception at their homes, these days a typical wedding includes an open bar, beautiful decorations and professional photographs. As weddings have become more glamorized, vendors have also started to charge a premium for their services, sometimes as much as 500% more than in decades past. Most couples borrow money to help pay for the venue and catering, which are two of the most significant expenses. Some also finance the cost of an engagement ring. When people talk about borrowing money for a wedding, they usually mean getting a personal loan or opening a new credit card. There’s no type of loan that banks or credit unions offer specifically for weddings. According to a 2018 Student Loan Hero survey, 21% of couples planned to use personal loans to finance their wedding. There are two types of loans: secured and unsecured. An unsecured loan has no collateral behind it. Personal and student loans are the most common types of unsecured loans. A secured loan means there’s collateral backing the loan. Mortgages and auto loans are secured loans, for example. If you miss enough mortgage payments, the bank can foreclose on your house to recoup their losses. The same holds true with your car loan. Miss enough payments, and the bank could repossess your vehicle. You can find personal loans through a bank or credit union, either the one you currently bank with or a new company. If you go this route, it’s generally a good idea to shop around for personal loan lenders so you can get the best rates and terms available for you. The type of personal loan you qualify for depends on your salary, credit score and other debts. Most personal loans range from $1,000 to $100,000 and terms are between three to seven years. Interest rates, known as the Annual Percentage Rate (APR) for personal loans depend on your credit score, but some start as low as 4%. Those with poor credit could pay up to 36% APR. Should I take out a loan or use a credit card? Depending on your credit score and debt-to-income ratio (the amount of debt you owe versus the amount of money you bring in), taking out a personal loan could be a less expensive option for covering a large expense, like a wedding. Especially since your credit score can impact how high or low your interest rates will be for the loan. But if you have poor credit, or a poor history of monthly payments, banks might not be willing to take the risk and lend you money via a loan. Another option would be to put wedding expenses on a credit card, instead of applying for a new loan. But racking up credit card debt for a wedding can lead to major complications. When you finance something with a card, there’s no set debt payoff date if you make the minimum payments. That can lead some people to extend their debt payoff timeline well beyond what is reasonable. Say you put $10,000 of wedding expenses on a credit card with 17% interest. Afterwards, you decide to only pay the minimum payment of $400 every month. At that rate, it would take 13 years to repay the loan, costing you $5,369 total in interest. And that’s if you only have a 17% interest rate. Some credit card interest rates go up to 30%, which could almost double your costs. Credit card companies don’t care how long it takes you to repay the balance, as long as you pay the minimum on time, since they end up making money off your interest. This is one reason why some people prefer personal loans for large purchases like weddings. A personal loan, on the other hand, has clear repayment terms and a set payoff date that can’t be changed unless you refinance the loan. When you take out $10,000 with a three-year term, you’ll finish paying it off in three years. If you have good credit, particularly a credit score of 700 or more, (or even better, excellent credit) consider using a personal loan to pay for your wedding. You could save thousands in interest and avoid getting stuck in a debt cycle. Borrowing money for a wedding is common, but it can be dangerous for anyone in a tight financial position. If you can’t afford to repay the debt, how will you afford to build an emergency fund? What happens if you lose your job, total your car or experience an unexpected medical emergency? Never take out a wedding loan unless you can comfortably afford to repay it. Go through your current monthly expenses and make a general budget. See how much leeway you have each month and look at your savings accounts. If you have an extra $400 a month and your personal loan will cost $250 a month, you can probably afford the loan. If you only have an extra $250 a month, adding new debt could put too much of a strain on your budget. It won’t allow any wiggle room in case of emergency. Many consumers assume that their financial situation will either stay the same or improve over time. That’s a dangerous outlook in a world where external factors have so much influence. If your company decides to relocate to another city and you can’t make the move, for instance, you could suddenly be out of a job. That would make repaying your loan difficult and could lead to default. If you’re getting married soon and know you’ll need to borrow money for the wedding, now’s the best time to work on your credit. The type of interest rate and total amount you qualify for almost exclusively depends on your credit score. In short, having a great credit score could save you money. Not just for financing your wedding, but for future major purchases you might want to make as you and your fiancé build your lives together. To get started working on your credit, the first step to take is to understand where your credit currently stands. To check your credit, get a copy of your credit report from AnnualCreditReport.com. There, you can see a report from the three credit bureaus: Equifax, Experian and TransUnion. Look over your report and see if there are any negative marks, such as late payments or defaults, and always keep an eye out for signs of identity theft. Unfortunately, some past events can’t be changed. If you filed for bankruptcy three years ago, there’s nothing to do except wait for it to fall off your credit report. You can, however, adopt some new behaviors that will increase your credit score over time. Once you know where you currently stand in terms of credit, it’s time to understand what steps you can take to keep building credit. First, always make your payments on time. Paying your credit card bill late might not seem like a big deal, but on-time payments count for 35% of your total score. Set up calendar reminders in your phone or set up auto payments for all your accounts to keep yourself on track. Next, keep your credit utilization ratio below 30%. This ratio is based on how much credit you’re currently using compared to how much you have in total. A credit card with a $10,000 balance shouldn’t have a balance higher than $3,000, for instance, to keep your credit healthy. The credit utilization percentage makes up 30% of your credit score. Avoid opening new credit accounts if you’re about to apply for a wedding loan. This includes credit cards, mortgages, auto loans and any other lines of credit. New credit applications count as hard inquiries and decrease the average age of your credit history. Both these things can negatively impact your credit score. Monitor your credit regularly to make sure everything is going well. You can do so through a free service like Credit Karma or if you’re a Self Lender member or even through your bank or credit card provider in some cases. Keep in mind, building credit takes time. It can take several months to see a boost in your credit score, especially if you have some negative marks in your past. But have faith - having better credit is well worth the wait.